You want to be proposed to when you're feeling your most accomplished, regardless of the fact that you have pit stains and haven't washed your hair in three days. Getting engaged at the end of a super long hike is the best way to celebrate your hard work and how you can overcome any challenges together. Plus, the photographer hiding in the bushes is doing far-away scenic landscape shots, so your sunburn and mosquito-bitten legs won't be a prob anyway! Even reading about public proposals makes you sweat a little (what if you'd want to say no???) and holiday/birthday proposals seem high risk (what if you say no, and then have an annual reminder for the rest of your life???). You're the least fussy person in the world and wish someone would pop the question to you in the comfort of your own home, on like, a random Tuesday. That in itself feels special to you because your soul mate would know that you're private AF. You have a wide net of friends and family you care for deeply and would definitely want around on the big day. Knowing that they're planning and coordinating a dance routine in the backyard to help your bae propose is all the validation you need; everyone important in your life supports the hell out of you two getting married. Plus, it's a perfect teaser to how absolutely fun your actual wedding would be! Anyone can (and hopefully should) remember their actual anniversary, and proposing on one is cute, but not as special to you as proposing on, say, the anniversary of your first text, or at the park you made out in on your third date. Having your partner remember a smaller romantic moment you both shared in the past makes you feel incredibly loved, and even more sure that you want to spend the rest of your life with them. You see yourself as a wholly original person and expect the same of your proposal. It doesn't necessarily have to be a public stunt—even just having the ring hidden in a pillow your S.O. gave you three years ago is creative enough to make you say "you've earned my 'yes'" (and hey, if it gets you a couple thousand new Twitter followers, it doesn't hurt). You love a little challenge, and nothing says "damn, my partner cares about me" like painstakingly planning out a scavenger hunt that eventually leads you to the ring. If you're getting married, it's going to be to someone who's thoughtful and clever enough to orchestrate something that brings out your slightly-competitive, very patient, in-it-to-win-it side. That's the person who gets you. It can be an ice skating rink during the holidays a la Serendipity or in the middle of Central Park like the ending of You've Got Mail. Honestly, you'll even take running out in your underwear in the middle of a blizzard if you get to emulate the ending to Bridget Jones' Diary. 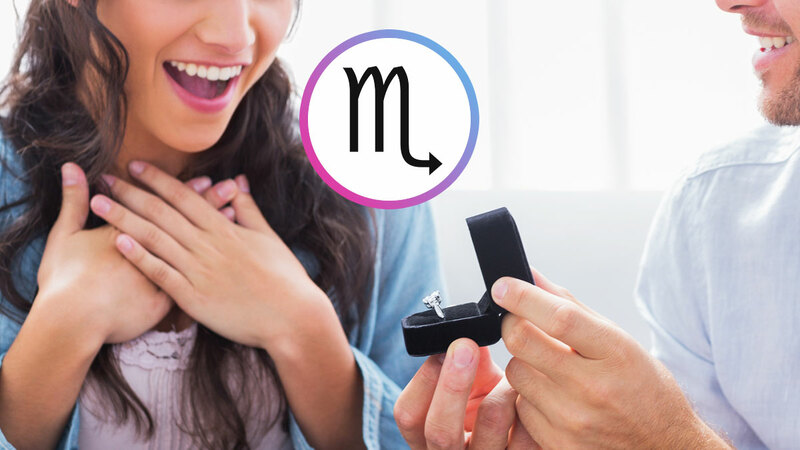 You want a proposal that feels cinematic and exciting, so you can channel your inner Meg Ryan/Julia Roberts/Mindy Kaling in the process. Oh no no no. No one's proposing to you. That's WAY too many elements out of your control. It's infinitely less stressful for you to take the reins and plan the surprise at the time and place that works best for you than have to hope your partner gets it right. Plus, you think any rules on who should propose based on gender are super outdated. You're the happiest when you're traveling, and love the idea of pairing the excitement of an engagement with the thrill of exploring a foreign city together afterward. Seriously, what's better than being proposed to overlooking the Seine and celebrating with red wine at one of those outdoor, cobblestone-street cafes, (accordion player optional but definitely preferred)? You're not picky about it being in a Michelin star restaurant or at your place after a particularly complicated home-cooked meal, but you want to feel fully relaxed (and full) when you get asked. The person you'd want to spend your years with is someone who gets your love for the finer things in life and is down to give them to you. You work so hard and want someone who knows how to treat you when you need to unwind. You're a sucker for passionate writing, and would immediately be won over by an essay about what you and your love mean to the person you care about the most. You'll also accept original songs, one-act plays, and oil paintings. As long as it's something your partner made and put real love into, you will be floored. Whether it's your cat wearing the ring or a bunch of corgi puppies spelling out "Will You Marry Me?" on their collars, anything involving some adorable fluffs immediately appeals to your sensitive, animal-loving personality. The only kids you know you want for sure are multiple pets in your home with your equally dog-obsessed S.O.